the industry in mind and a focus on key issues and trends. Presentations separate into eight tracks: Cutting, Finishing, Forming and Fabricating, Green/Energy Initiatives, Management, Stamping, Tube and Pipe and Welding. In today’s manufacturing environment, relying on one customer, one market or one process can spell certain death—diversifying is critical to survival. But understanding your choices and deciding how and when to diversify can be complex. This panel discussion will bring together your peers—those who have been there and done that—along with diversification experts to share what works and what doesn’t, identify an approach that fits your business and discuss the risks and rewards of various diversification options. In case study after case study, the pursuit of sustainable manufacturing practices and execution of conservation principles has proven profitable for manufacturers. This keynote panel will focus on how implementing a practical lean and green approach to consuming water, gas, utilities and raw materials can benefit not only the environment, but your business as well. Our panelists will share examples of how they’ve done it. If you want to learn how to improve your bottom line and gain a competitive advantage by going green, this unique presentation is for you. Learn recent developments in forming of aluminum, magnesium and titanium as light weight metals. Emphasis will be on these alloys as the industry is interested in saving energy and weight. These alloys perform poorly with the conventional testing and forming methods. Hear how state-of-the-art testing and forming methods can help improve their poor performance. This presentation will cover the anatomy of a safeguarding project. Learn how to safeguard your fabricating machinery and maintain productivity, reduce injury, and comply with OSHA and ANSI standards. Focus will be on improvements in CAD/CAM systems for punch machines that allow for tool path optimization and taking advantage of additional processes. Realized efficiencies also will be showcased in the form of case studies. 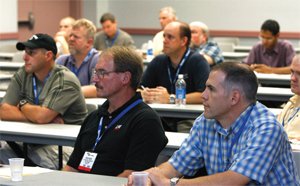 Attendees will learn s in which the latest punch press tooling innovations can be used to enhance fabrication productivity and reduce punch press setup times. New technologies, tooling products, tool steels and coatings are just a few of the topics that will be covered in this session. Discover profitable processes and procedures using today’s punching technology. This presentation will address cost reduction through process integration, automatic tool/turret changing, hybrid technology, and parts sorting. Topics for this presentation include; request for quote management, material needs, operation time and large assembly estimating. Learn about new green technology, new control innovations, and how to save set up with technical advances. Attendees will discover how to apply current bending technology, including adaptive bending and touch screen programming. Automated press brake features such automatic positioning and bed crowning to improve your bending productivity by reducing setup time, trial-and-error bending, and producing accurate parts from start to finish will be discussed. Learn how to reduce costs in press brake processing through many outlets including electrical consumption, ergonomics, reducing scrap, and offline programming. Using the right machine for the right job is also a very effective to improve efficiency in both. Which Press Brake Tooling System Is Best for You? As press brakes become more ad-vanced, it is imperative for sheetmetal shop owners to equip them with tooling systems that take full advantage of the technology. This presentation will give end users insight on the pros and cons of each tooling style, the trends in tooling development, and provide a better understanding of how to select a tooling system. Learn what systems will work best for your organization, the differences in robotic applications and the pros and cons of introducing robots to your operation. Attendees will walk a with an understanding of how to evaluate robotic equipment and suppliers, effectively budget for robot applications and avoid failure. Today there are many value-added processes incorporated in the rollform line including: notching, punching, embossing, painting, welding and sweeping. Learn how rollforming can provide the same section at a lower cost to the customer without the added cost of secondary operations that other metalforming processes require. The focus of this presentation is on potential benefits and savings of online profile inspection for rollformed application, such as gathering quality data faster and more accurately, creating quality reports, data archiving more efficiently, easily completing process capability studies, improving startup processes, and reducing scrap. Proper rollform calibration and the importance of rollform tooling design and build standards will be presented. Attendees to this session will learn about in-line punching: pre and post, stationary and flying (also rotary punching), flying cutoff dies: slug, slugless and combination, and system integration. This session will provide an overview of the latest in vision error proofing, robot guidance and automatic workcell setup and maintenance through intelligent vision systems. It will describe the ease of use for the integrated vision as it applies to arc-welding robots. The concept behind small batch fabrication automation and successful implementation of a small batch production automation project will be discussed. This presentation will look at reasons for implementing robotics. Discover the variety of systems available in the welding field. Learn methods and considerations for implementing robots in simple welding applications. This presentation will take a look at the advantages and disadvantages of starting with preblanked material as compared to coil. The pros and cons of a die in a press, turret press, laser and coil processor will be explored. Learn how the best tolerances can be produced, how to properly measure the results and the latest technology used to improve efficiency and quality. New technology and techniques will be discussed, as well as getting the most out of your existing equipment. Special focus will be on the high-strength materials that are becoming more common in today’s market. Hazardous air pollutants and volatile organic compounds are very concerning. As a result, formulators continue to seek alternative materials that optimize cleaning performance while having low or minimal negative impact on the environment. Learn how to green up your industrial parts cleaning process. Attendees will learn the basics of dry ice blast cleaning and how this technology significantly reduces cleaning time and costs. Downtime caused by various factors is eliminated. This process is safer for workers than traditional methods. Blast cleaning, a mechanical surface preparation technique is not new to the manufacturing sector. This establishedtechnique can be harnessed to produce desired results and also be environmentally friendly. When monitored and controlled, it can lead to lower operating costs and increased productivity. Attendees will learn state-of-the-art machinery installation techniques and explore the relationship between installation methods and their effect on machine performance, productivity and the surrounding environment. Basic machine structural dynamics and vibration theory will be explained using technical illustrations and case studies. Learn how to identify the best transfer solution for your application and press to increase press capacity and flexibility, creating a productive and profitable multipurpose press line. The pros and cons of the two most commonly used servo transfer systems will be discussed. For any given press shop problem, there may be multiple causes and twice as many solutions. This presentation provides practical solutions and a methodical approach for solving many common problems, tips for isolating tooling problems from material problems, and some common mistakes to avoid. Due to the increased use of high-strength steels, budget and qualityconcerns, coping with springback continues to be a leading issue for stampers and tool and die makers. In this session, learn what springback is and isn’t, review its sources and methods for predicting and measuring springback, and learn how to correct for its effects. This multimedia presentation focuses on the advantages of installing fasteners within the stamping process to eliminate the secondary operation of fastener installation. It includes a description of the components that make up in-die systems, animations of system operation and case studies. This session will focus on using servo direct technology to control the press cycle for in-die processes with a case-study application of in-die welding for fasteners as an example. It will describe advantages to changing process flow in stamping facilities and consider future opportunities to eliminate downstream equipment and overhead. Learn how to replace traditional die-design methods with performance-based die-engineering strategies. This approach integrates critical die performance criteria through the application of sound die engineering principles to assure a robust manufacturing process and a tool that is neither under-engineered nor over-designed. Attendees will learn business im-provement tips and an understanding of how the latest on-demand SaaS-based solutions can help their companies improve quality, productivity and profitability. Presentation includes a case study from a stamping company describing its experience and the benefits of implementing a SaaS solution. Ideas will be presented with real product, tooling and process design solutions for contract manufacturing challenges that result in cost and quality improvements for the manufacturer and its customers. Focus will be on value-added stamping, forming and automation techniques. A case study describes an automotive stamping company’s transition to a team-based production environment. Spotlights specialized IT software, standardized process activities and application of lean techniques on the shop floor and the use of state grant funds to develop interactive training systems to accelerate change. Learn the benefits of recently developed cemented carbide grades for stamping and metalforming tooling applications that resist the contact stresses and severe adhesive and abrasive wear common in stamping operations. Hear how these grades enhance functional performance of carbide tools in stamping operations. This program will define how to choose the proper clearances for the many different steels being punched. It will identify the various punch and die materials and surface treatments available to improve productivity and illustrate punch and die failures and trouble-shooting techniques to counteract them. Attendees will learn how to correctly select, apply and utilize electronic sensors for minimizing die repair, scrap and quality issues and for the simplification of dies and tooling. The goal: prevent die crashes, employ mistake-proof fabrication and assembly operations, and accurately measure part quality in real time. In-die inspection not only complements lean manufacturing but assists with efficient, profitable small-batch production. Information presented will allow attendees to know when to use digital sensors for simple part detection versus analog sensors for in-die/in-process part-quality measurements. Hear recommendations on tool making, including tool steel selection through failure analysis, sheet hardness levels, surface finish and treatments, die clearance and coatings. Case studies will show how you can improve productivity and reliability with the proper tool steel, coating, surface conditions and operating parameters. This session will highlight the major factors that contribute to splitting, cracking and twisting problems associated with forming advanced high strength steel. Learn key principles to identify and address these problems, allowing for trouble-free manufacturing. Attendees will learn how modern controls make it possible to accurately and automatically perform die protection and in-die part quality measurements and adjustments. These and other tools will be described to help stampers hold critical dimensional tolerances. Learn about the payback of a sensor program to the company’s bottom line, competitiveness and to its growth. Attendees will come a understanding that investing in advanced mistake-proofing support technologies will help assure survival in these tough economic times. This presentation will discuss cleaning methods for stamped parts and provide the knowledge to work with suppliers and customers on cleaning requirements. It will illustrate cost savings realized by evaluating the entire stamping process including lubrication, cleaning, rust protection and painting. This session will review different techniques for applying lubrication where and when it is needed in order to maximize production and minimize usage. Methods for containing, collecting and recycling lubricants will be reviewed, as well as actual ROIs realized by companies that have implemented these procedures. Learn how lean and green practices can be used to assess the impact of lubricants on metalforming operations, from initial application to welding, cleaning and painting. A case study from a chassis stamping plant will demonstrate how to achieve significant savings by identifying and eliminating waste and nonvalue-added activities. Learn how to select your lubricants and evaluate their performance to turn your stamping operations lean and green. Green lubricants will be defined and their pros and cons compared to standard chemistries will be discussed. Case studies will be presented to demonstrate cost-saving techniques and evaluations. This presentation will address the need for a simplified simulation solution for draw die simulation and advanced simulation technology. Learn how to increase cycle times, lower software costs, improve die-design quality and lower user qualification thresholds. In this session you will be introduced to the essential metalforming analysis techniques of circle grid, finite element and stochastic analysis as it is applied to sheetmetal stamped parts. Learn to read and interpret forming limit diagrams and discover methods to bring formability measurement to the production environment. This presentation will cover all of the fundamentals associated with registering for, identifying and bidding on government contracts. Attendees will become acquainted with the availability of services near their facilities and across the country that provide assistance with the government contracting process. Great line up. We will be linking to this great post on our website. Keep up the great writing.